Seeing Peter Wright’s The Nutcracker again after several years of witnessing other productions brings its success as a dramatic piece to the fore. Placing the traditional story within an outer tale of Drosselmeyer separated from, and then reunited with, his nephew Hans-Peter, adds a level of genuine emotion which cannot be matched by seeing a little girl finding her lost wooden toy. It works. It is a tear-jerking moment when Drosselmeyer hugs his nephew Hans-Peter during the score’s final bars. 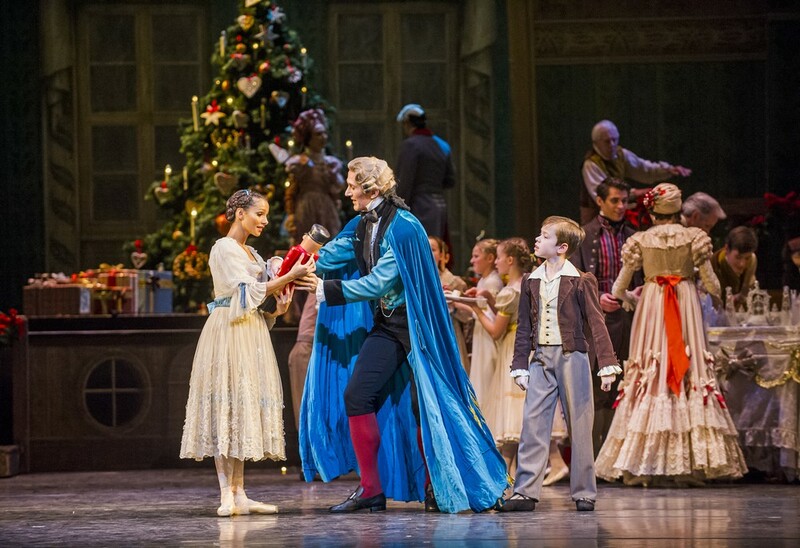 It closes the drama and, despite the plentiful dancing during the second act divertissements (in themselves more interwoven with the main story than is usual, with the constant participation of Clara and Hans-Peter) it returns neatly to resolve the opening scene of the ballet. Drosselmeyer, a timeless magician and creator of mechanical toys and clocks, was once employed in a royal palace where he invented a trap that killed off half the mouse population. In revenge the wicked Queen of the Mice cast a spell over Drosselmeyer’s nephew, Hans-Peter, which transformed him into an ugly Nutcracker Doll. The only way to break the spell was for the Nutcracker to slay the Mouse King, thereby committing an act of great bravery, and for a young girl to love and care for him in spite of his awful appearance. Even if a backstory of a trap and a mice queen is not obvious, we do know that something lost is restored, contrasting with Clara’s loss of innocence during the ballet. 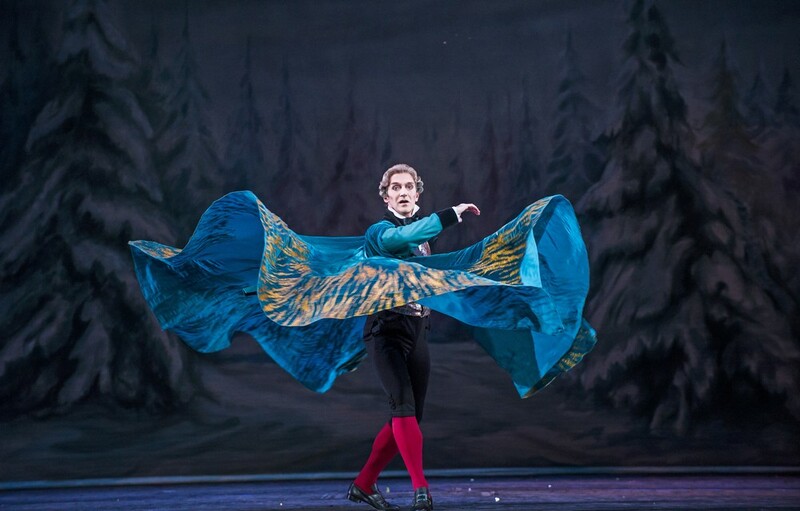 Gary Avis, as Drosselmeyer, dominates the stage from the opening of the curtain to its close, swishing his cloak, while he knowingly teases and preens. Wright weaves the character into the story throughout, and Drosselmeyer casts his magic over snowflakes and toy soldiers, but it is a magic evidently less powerful than that of the Queen of the Mice. Avis’s superior yet kindly air contrasts effectively with the emotional tenderness of the reunion with his nephew. It’s a winning performance. Hans Peter, freed by Clara’s true love, is played by James Hay, a perky live-wire dancer whose slight build and crisp technique make him ideal for this role. His Clara was played by Anna Rose O’Sullivan. O’Sullivan is Royal Ballet through and through. She trained at The Royal Ballet School, joined the Company five years ago, and was promoted to soloist last year. The ‘English Rose’ label has probably been applied to her many times already, and it’s fitting, yet with her petals there are thorns. She looks delicate and feminine yet leaps as high as the men and throws off her chaîné turns with exhilarating speed. An enchanting talent. The Company’s always excellent corps were not always in unison for the snowflakes — the unbelievable rhythm of a month of shows with matinee and evening performances was beginning to take its toll. Even so, the scene is still uplifting and who wouldn’t be moved when the children’s chorus join the orchestra. Also, here’s a technical note for other ballet companies: snow falling from behind the downstage border in a thin strip is effective, but snow falling from the front to the back, covering the entire stage, is pure magic. In the Sugar Garden in the Kingdom of Sweets Beatriz Stix-Brunell’s Rose Fairy shone out, as did a replacement, Joseph Sissens, who graduated into the Company from the School in 2016. He joined the equally talented Matthew Ball for the Chinese Dance, and is certainly one to watch. The responsibility for the Grand pas de deux was given to the outstanding Francesca Hayward and Alexander Campbell. Strangely impeded by some erratic tempi from the vastly experienced Barry Wordsworth, they shook off any choreographic difficulty with seeming effortlessness. Campbell is everyone’s favourite Hans-Peter and, while he maybe not an obvious choice as the prince, it was a joy to see him dance this role with his clean landings in fifth, his muscular manèges, and his attentive and secure partnering. He’s also quite a showman with his flamboyant finishes and playful grin. Unquestionably, Campbell had a dream partner in Hayward, a dancer he is often paired with. She is THE musical box ballerina: delicate and poised with perfect proportions. She’s as light as a feather, and radiates serenity as her face illuminates the stage. Those off-axis epaulement positions which can seem forced are incorporated seamlessly into her dancing and all is presented with great ease, and also freshness, as though she’s inventing steps on the spur of the moment. Hayward and Campbell have been coached by Lesley Collier, and it shows. Stylistically perfect with a light touch for even the most difficult passages. When they execute the same sequence, they are always beautifully together — a true partnership. And so the ballet comes to an end — Clara is reunited with her Nutcracker, and rushing outside her house into the snow she sees Hans-Peter, who looks a lot like the boy in her dream. She indicates to him where to find Drosselmeyer’s workshop… and this is where Peter Wright should have called in a favour with Tchaikovsky: just a few more bars to saviour their reunion would make the ending even more satisfying. and we all went home with a smile on our faces!